Uncategories Japan Named and Launched its 2nd Izumo Class Helicopter Destroyer DDH-184 "Kaga"
TOKYO, -- Japan's Maritime Self-Defense Force (JMSDF) launched its second Izumo-class Helicopter Destroyer. The vessel was officially name "Kaga" (hull number DDH-184) during the ceremony at the JMU Japan Marine United Corporation shipyard in Yokohama Isogo. 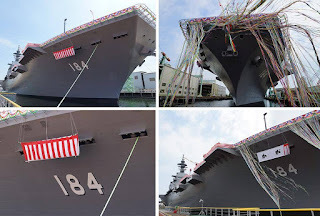 DDH-184 "Kaga", the second Izumo class Helicopter Destroyer during the namming and launching ceremony on August 27 2015.